I was walking behind Emily yesterday and realised our Occupational Therapist at Royal Rehab based at Ryde who designed a wheelchair accessory for Emily in 2012 was remarkable! Her design is still going strong in 2014 and there’s no necessity to reinvent or adapt her original. As it’s said “if it ain’t broke, don’t fix it” but with time things do evolve and change is inevitable as time passes. 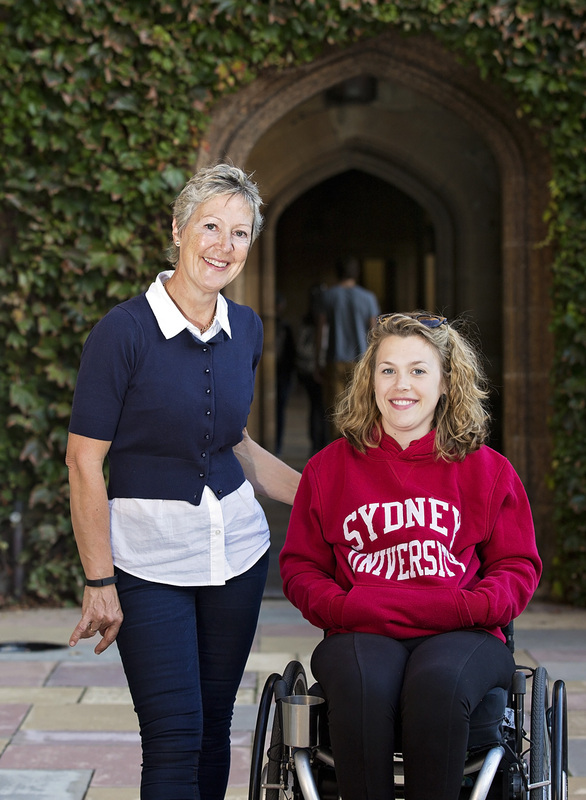 I was loitering in the University of Sydney Disability Services Office while Emily enrolled for semester two studies. The University produce various Counselling and Psychological Service information sheets for the students and the one entitled Tackling Change Head On caught my eye as I am trying to address major changes in my life; becoming a primary carer. I thought I’d look at this sheet and modify its message for carers. Change can be awkward to address and experience with setbacks inevitable.The key to overcoming setbacks is; identifying exactly what I want to achieve, being clear about why it is important to me, and then figuring out what is getting in the way of taking the action that matches where I want my life to go. What is my aim? What are the changes I want to live my life by? What actions will I need to take to change. I thought about these questions. My aim is to be as healthy, social and energetic as I can be within my caring role. I aim to facilitate Emily’s independence by gently reinforcing her confidence, ability and supporting her lifestyle choices. I want to be a redundant carer. What gets in the way? The information sheet instructed me to: Write down all of my excuses, cross off the ones that are ridiculous and find a solution to those that are genuine. My most used excuse is: Emily can’t manage without me! The truth is that Emily is gaining in confidence and ability everyday and if I don’t detach myself she will never experience independent living. She won’t gain any insights into how to manage alone or insights into the issues that need to be addressed in order for her to cope more efficiently alone. It takes courage to leave Emily and it’s a challenge for me to ‘let go’. I have to accept that Emily might falter alone but that mustn’t get in the way of having a go. I use “I can’t leave Emily” as an excuse although I so firmly believe my own sentiments that I struggle to see it as an excuse. On reflection I have to be honest and ask myself if Emily really needs me around as attentively? I could leave her more often with no detrimental affect and probably more resilience would be gained by us both. The human tendency to avoid discomfort hinders our ability to achieve change. I have to embrace a degree of discomfort, guilt and anxiety when leaving Emily alone to learn. Keep it up. I experience positive reinforcement of my changing behaviour; it is such a delight to establish Emily’s independent that I am motivated to leave her. I must remember to learn from any wobbles and setbacks that happen but keep going. Change can only happen with resolve, determination and focus. I am resolved to manage the changing demands within my role as carer. I also want to enjoy this life journey with Emily as our goals are intertwined; each of us wants a fully active, interesting and purposeful life – that’s achievable with hard work and a coffee on our way! This entry was posted in Carers, Carers Support, Life after SCI and tagged Carer Support, caring, Change, Everyday Caring, Healthy choices, people with disabilities, spinal cord injuries by everydaycarer. Bookmark the permalink.